A Primer on Brettspielwelt.de (BSW): the Games, the Client, and What You NEED to Know! NOTE: The list is not sorted. Initial entries are in alphabetical order 'cause that's how I entered them. At the end, however, you'll see the newest games added to BSW. Use the index (above) to navigate to the game you want, or look on the last page to see what's new at BSW! Playing board games face-to-face is much better than playing the same game online (most of the time): you get to handle the cool bits, you get to smack talk your buddies, and you can take a food/beer break whenever you feel like it. But if you just can't get together as often as you would like, having an online version available is a good thing. Many games are available at BSW. Some are very well done -- others, not so much. I originally had 2 lists, one for the well-done interfaces and another for the not-so-good. I've since consolidated the lists, and also expanded it to list every game available. As I play them, I'll try to add some information about each game's interface and also put in some BSW pictures instead of the default ones. If you are scratching your head wondering what the heck I am talking about (which may well be possible, given all the new faces around here), read on! BSW = Brettspielwelt, the world of boardgames. It is a free German site where you can play a variety of "euro" games against people from all over the world. There are some single-player games available, too. The most common complaint against BSW is that it is hard to simply find an opponent and play a game ... you have to deal with the whole Metagame thing (below). If you can get past this (and once you know how, it is actually very easy finding games) you will have a great opportunity to play against some very good players. Also, some complain about how some people at BSW whine about poor play, kingmaking etc. Well, as in any large group of people you are bound to find some a$$holes. But most people are there to play, and most are very willing to help you out. So, by all means go, play! There are a variety of links at the bottom, which should give you more than enough help. BSW is a virtual world: there are cities (city-states, really) which have mayors, ambassadors, etc. ; there are guilds which have whatever it is guilds have; there are taxes (unless you are a citizen of certain cities); there may even be death (I think you can be banned?). You earn money (talers) by playing games or winning lotteries. You can spend money to buy houses, do landscaping ... even start your own city. All of this is completely irrelevant if you just want to play games, but knowing something about it is helpful in getting around and in finding those games. One nice thing is that you don't have to do anything to participate - just play. As you play more, your rank goes up. With increasing rank, you get access to a few more commands. Check some of the links below for more information. Download and install the client! Do it now! The application updates itself as needed, and helps you get to and play the games very easily. You can customize the appearance by configuring the .prop file (see #2). It is a much nicer way to play games at BSW, compared to the through-the-web (java) application. This is the file (.prop is the file extension) that configures your client -- you'll find it in your Brettspielwelt folder. Freshly installed, it has only a few useful commands. You will definitely want to customize it. I keep an updated copy of my .prop (do a find/replace and put your own id/password there) on BGG! 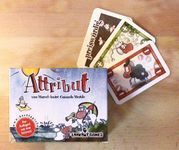 You have 2 options: either open your Brettspielwelt.prop file in a text editor and copy/paste the info found at the link above, or replace your .prop with the latest version I've uploaded to BGG (this one, however, is not updated as regularly); you'll find it under Miscellaneous Game Accessory, here. This will generate a .prop file with many commands configured with control-key combinations. You will also have a bunch of drop-down menus allowing you to jump immediately to game rooms, issue commands etc., without having to remember any actual commands yourself. It's all in English, of course, and designed by/for EnglishTown! Unfortunately, it looks as if this site isn't kept up to date. You should check out Joe Lamer's excellent PDF, right here at the 'Geek. Look for the latest version of the BSW Guide, under Miscellaneous Game Accessory. A great thread summarizing the highlights of BSW and the user interface, including some useful commands. I suggest, however, that you just use the .prop file linked in #2, above. Jeff Bakulchuk (TheBoomer) has put together a great site. You'll find a quick start guide, detailed game instructions, more information about the metagame, and much more! Unfortunately, I don't think it's being kept up to date any more. This is the website for BSW's largest English-speaking town. The site has some useful information about the town and its citizens (now including ELO ratings). Consider joining and becoming a citizen of ET! Why? They have (almost?) all the games available in BSW. If you join, you automatically start in the town when you enter BSW, and you can enter the town chat channel. Plus, no taxes. Join by messaging the mayor (can change monthly). There's a town puppet "Archie" that you can use to leave a message: type "/tell Archie" then "@send TheBoomer message" - TheBoomer will get the message when he next signs on. Why join? Well, if you're into the metagame: there are no taxes (probably a slew of other reasons I know nothing about). If not: when you enter BSW, ET members automatically appear in ET. That's nice because everyone speaks English, so it is easy to find and communicate with other opponents. Also, as one of the largest towns ET has game rooms for almost every game in BSW ... very convenient! How to join? In BSW, go to ET and type "/tell TheBoomer (or whoever is currently mayor) Hi, Mayor! I would like to join your wickedly cool city ... may I?" in the main window. If (s)he is online, (s)he will message you back and tell you what's what. Note: There are plenty of other cities, too, including one with lots of BGG Werewolf players, another with lots of Canadians, etc. This provides a little information about this service. Not much info, just a little! The interface isn't perfect, but it's pretty close. You'll want a large monitor display if you play 3er or 4er games; otherwise, you'll spend some time scrolling around. The only interface change I'd make would be to put the large version of the player mats (not shown) in their own window, or make them detachable, so that you could flip back and forth easily. Once you know the game, though, that shouldn't be an issue: the miniature version of every player's mat, in the right upper corner of the screen, is always visible and easily readable. Simple party game, sort of like Apples to Apples but better. You do, however, need to get the right people to play; there's an active group at BSW. Simple interface, well-done ... you have to be fast with your mouse (using my trackpad doesn't work so well!)! A party game. One deck has cards with a word on each: deal 4/player. The other has red or green sheep: each round, deal 1/player (all face down). Players take turns picking a word or phrase (eg edible underwear). Everyone picks one of their cards that matches (if they got a green sheep - eg chocolate) or doesn't match (red sheep - eg GWBush): these are revealed simultaneously. Then everyone races to grab click a card (but not their own) that matches, although you may choose not to grab anything ... it's very much like Apples to Apples except that you have to (get to?) come up with your own categories. Points are awarded based on what you grabbed and the card you played: you earn 1pt if you had a red sheep and no one took your card, and/or you selected a card that someone with a green sheep played. You lose a pt (negative pts possible) if you had a green sheep but no one chose your card, and/or if you chose a red-sheep card. Play a certain number of rounds. This is much better on BSW, where there's some anonymity and the topics are a lot more interesting (ie risque). It would also be better with people you know well and are comfortable with. With a bunch of new people, it's likely not as good - it's some work to create the phrases (which is done for you in Apples to Apples) and the topics will likely be less interesting. The classic game; the interface is pretty clean and easy to use. You can play a single game, or a multi-game match where the doubling cube is available. They also have a version for solo play, called Sologammon (look for it through the Client application, or once you're in BSW). In Sologammon, click the fish to start your game. An OLD (1967) game from Sid Sackson, "particularly enjoyed by women" (BSW description)! It's a brain-burning game of trading this for that for the other thing, trying to come up with certain combinations of gems as closely (with fewest extra gems left over) as possible, before someone else does that same combo. It can also be played solo, to maximize your score. Added in 2006? Haven't tried it yet, although I can't imagine this would be nearly as good online. The game is about TRADING, and unless there's a miracle in interface design happening, it's going to be much harder online than face to face! It's a very simple game, and this implementation is pretty good. You even have the option of playing with the variant in which you can reverse play order by exactly matching the previous player's card total! To play, just select your cards and hit the Play Cards ICON; if you pass, hit the Remove ICON, then select the bucket to discard. After playing your card(s), remember you have only 3 seconds to draw a card (click the deck of cards shown between the 2nd and 3rd player in the top row). So don't take your time and don't play if you have a lot of lag in your connection! Alles im Eimer was played in the Deutschen Mannschaftsmeisterschaften in 2005. It can be played with the â€œReverseâ€ and â€œLast Man Standingâ€ options. The colours are vivid and the play fun. I've never played the board game, so I can't compare. Nevertheless, the BSW interface is very clean - easy to see who has what, how many tiles left, board positions ... very well done. Huh? What theme? This is clearly an abstract tile-placing game, where you are trying to optimize the luck of the draw in order to control tile placement. It is not really an area-control game, per se, but it has some of that feel: you need to try to control the tables. You would like to limit your opponents' options by placing tiles so that either they cannot score at the same table after you (for more points), or so that you can come back and score a lot of points yourself. As far as I can tell, that has nothing to do with seating people at a cafe. And who are you, anyway ... a waiter looking for good tips? Hmm, maybe that makes some sense, after all! Nevertheless, the theme works reasonably well, although (for example) I'm not sure why the Italians are so friendly with the Chinese ... but maybe that's just my ignorance showing! Very simple, very fast. Usually, play 2 tiles, draw 2 tiles. As the game progresses, more likely play 1, draw 1 (to avoid running out of legal table plays, and being forced to seat someone at the bar). Despite having perfect knowledge (except for what's coming up in the tile draw), it is pretty easy to make decisions quickly. On the one hand, that's nice: there really shouldn't be any analysis paralysis here. On the other, it's really not ... the game almost plays itself. The optimum play seems pretty self-evident, and it seems likely that the game, with competent play, would come down to the luck of the draw. While this is a moderately fun game at first, it doesn't hold up as well with repeated play. I don't think it's boring ... it's just not very challenging. It is certainly short enough and fun enough to serve as a filler, but I don't think it will be much more than that (despite being the Spiel des Jahres winner of 1989!). This is a classic! A simple game of push-your-luck: roll 4 dice, arrange into 2 pairs, and move those 2 mountain climbers up. You get to move 3 climbers each turn; once the 3 are chosen, must move at least one of them with each roll, or your turn is over and none of them advance. On BSW, the dice are color coded (orange/red). If you're only using 1 pair, it's the orange pair. Just move your mouse over the various columns; the dice will change color appropriately, showing the legal combinations. Click when you have the combination you like. You can also click on the board to move pieces: possible columns will become highlighted; hovering over one will make it glow brighter and the dice above the board will move to it. Left click to continue your turn, or right click to end it. If you like what's been selected, hit the green arrow to roll again; red arrow ends your turn. The interface isn't too bad, really. The problem is that it can sometimes be very difficult to click in the exact spot it wants you to click, and your meeple may end up being a thief instead of a farmer (or whatever). The graphics on the Hunters and Gatherers version also seem poorly defined. Another game where a large screen is needed to avoid a lot of scrolling. Variants are available as options when starting the game. Interface is pretty clean and easy to use. The year is 1672. The notorious fortress of Cartagena inspires countless adventure stories and rumours. â€œNo-one can escape from hereâ€ claims the architect of the of dungeon. The aim of the game is to be the first to escape with all men. Each player has six pirates, which he must lead through the twisting tunnel as fast as possible to the coast. There a boat lies ready. Whoever leads his men first into the wooden boat, wins the game, however, it is a long tunnel. You can only move your men if you have enough cards and can tactically arrange them to take advantage of previously player pawns. Typically, the direction is forward down the tunnel, however, you must draw bak at certain times to aquire new cards. This to-ing and fro-ing gives the game the uncertain feel as to which team is actually in the lead. You need to decide when to play and when to draw back to gain the advantage. - profi: cards are played on the left OR right of the rows, according to the smallest difference between the card played and the cards on the ends of the rows. * Four rows to play your cards to. * Each row can have up to five cards. * All players place one of their ten cards at the same. Afterwards, these cards will be revealed. * Each row has the lowest card to the left and the cards are in ascending order. * If your card would become the 6th card in a row then you MUST take all the cards in the row and be penalized accordingly. * The game finishes when someone gets 66 points against them. The winner is the person with the least penalty points. Now that Puerto Rico has been unceremoniously dropped from BSW, this game (for me) ranks as the best, in terms of interface and playability. Everything you need to know is on the screen (cash, resources, points, favor track), and you don't have to worry about forgetting to pay your coin or give an opponent a VP for use of his building; it's all automatic. The idea is that players are builders helping to build the king's castle (3 parts: dungeon, keep, and towers or something like that). You use initial buildings (place your workers, in turn) to generate resources, which you use to build better buildings (which generate more/better resources or help in other ways) and to build parts of the castle. Scoring happens when each of 3 stages of the castle are done, or when the game timer marches forward to specific intervals (player actions can affect this speed). In addition to producing resources, buildings/workers can change turn order, reduce the cost of placing other workers, and earn king's favors. You also earn favors each turn by contributing the most to the castle that turn. What are favors? Well, little freebies - ways to get extra resources, or build buildings more easily, or extra cash, or extra VPs. When the game ends (castle complete, or game timer moves to end), most VP wins (unused resources and cash are also worth some VP). Players select roles and take turns in order building buildings of various types, some of which modify basic game play. Game ends in round when anyone builds 8th building. Get points for variety of colors, being first to build 8, etc. Most points wins. The key feature is the role selection where players take turns choosing a role, and everyone has imperfect knowledge about which roles were available for everyone to choose from (earlier in turn order know more, and have more choices). Roles do various things, like steal from another character, get a bonus income from specific building types, become starting player, etc. Initially, it's hard to figure out what the turn order is (left to right, top to bottom) and what the role symbols mean (X = unavailable, O = out of round; listed in numerical order). But once you know what all the icons are, it's very easy to pick your options (sort of like the Tikal player cards - once you know how to play, all the funny symbols make perfect sense!). Apparently, a traditional German card game. A version of the Dictionary game, where someone makes up a definition (added to 3 already present on the card, in this game) and the others try to choose the correct definition. I'm sure it's very nice, but it hurts my brain just looking at it! This new game by Kris Burm bears some resemblance to "Focus." A player moves a stack of stones a distance equal to its height, possibly gaining control of other stacks. 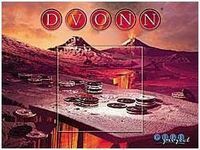 Of particular significance are the three "Dvonn stones" - they are the source of life. Every stack not connected to a Dvonn stone is removed from play. Therefore, always keep a close eye on these stones, lest your stacks be "Dvonn with the Wind." In Dvonn Kris Brum has created another engrossing 2-player game. This is the first game in BSW to include time-keeping and game-logging functions. A speed game in the style of Ligretto (AKA Dutch Blitz). Players are in 2 teams. Cards are either Passing (have 2 teammate names and 1 opponent name; those cards can be played on top of them) or Scoring (one of your team). Each person has 3 spaces where they can put cards available to be played (like Ligretto). Players play simultaneously, racing to play the correct card until someone scores a goal; then repeat till a team has scored 5 goals = winner! The BSW version has sound (each team hear's its own available legal plays announced). FussballLigretto is fast and furious. Don't think too much about the game as this may be a disadvantage. The players try to shoot goals in several rounds as fast as possible. Each team is given 75 cards, which show all 11 players in their team. It requires quick reaction to the cards being played and keeps going until a goal is scored. The best moments in the game is when several players want to play the same card at the same time. This can lead to dispair if your were too slow yet again! This however lends itself to playing cards for future strategic plays but also lets your opponents see them! This is a mancala variant, by Arthur and Wald Amberstone and described in Sid Sackson's book A Gamut of Games. 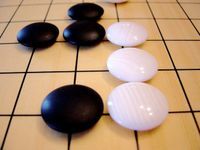 Each player has 4 good ghosts and 4 evil ghosts, but only the player can see which ghost are good or evil (like in Stratego), place at the back of a 6x6 size board. Each turn a player moves one of his ghost one square vertically or horizontally. Moving into an opponents ghost kills the ghost. Object of the game is to get rid of your own evil ghosts, kill your opponents good ghosts, or move one of your good ghost off the board from one of your opponents corner squares. 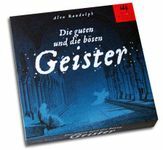 Geister is a nice occasional game. The attraction lies mainly in the bluffing element of the game. You can play different boards (9x9, 13x13, 19x19), timed games, handicaps, and several other variations, too. The board is a 7x8 grid of hexagonal pieces (floating ice tiles) with 1, 2, or 3 fish on them (randomly placed). Players get 2, 3, or 4 penguins (for 4, 3, or 2 player games, respectively) and take turns placing them on any 1-fish tiles, then take turns moving a single penguin. When a penguin moves, you take the tile it started on and add it to your score pile. Penguins may move for any distance in one direction to a new empty tile, but cannot jump over other penguins or empty spaces. The game ends when there are no legal moves left (you do get to score the final tile your penguins end up on). Scoring is simple: 1 point per fish. Highest score wins! This is an abstract with a thinly pasted-on theme. But the theme works remarkably well! The pieces are cute, and the game plays very quickly.